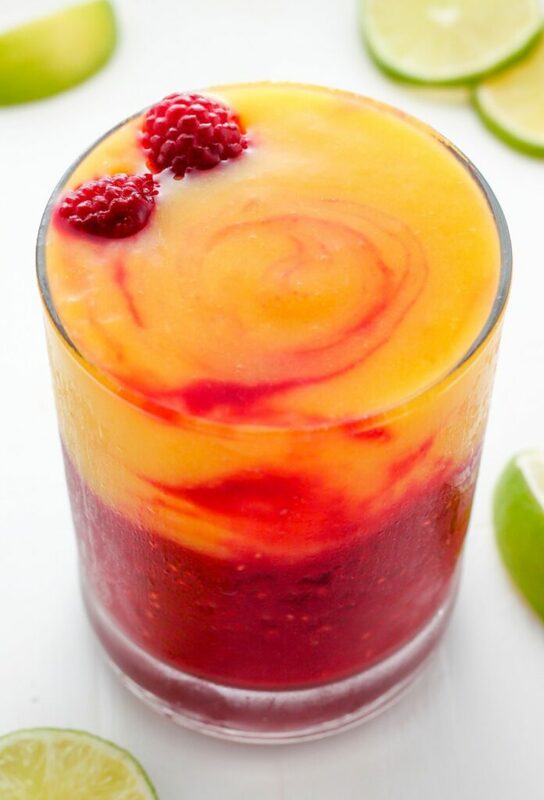 Fruity and fabulous, these Raspberry Mango Margaritas are swirled together to create the ULTIMATE Summertime drink! Treat yourself to a batch today. I love frozen drinks in pretty much any form. Whether it’s a chocolate frosty from the drive-through (my guilty pleasure! 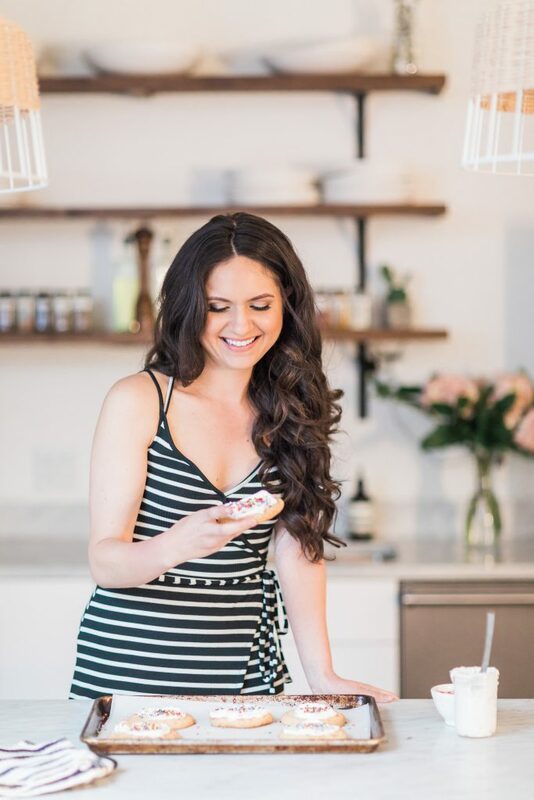 ), a homemade strawberry watermelon daiquiri, or a healthy banana cream pie smoothie for breakfast – I crave them all. Last weekend my best friend came over for a MUCH NEEDED girls night and I knew frozen cocktails were a MUST for the event. Our theme of the evening? MEXICAN and movies. She was in charge of the burritos (recipe coming soon) while I whipped up this spicy mango guacamole and a batch of margaritas. That’s where these pretty little Raspberry Mango Margaritas come in! Part raspberry, part mango, all delicious – this is one frozen drink you MUST make! You’ll want to make the raspberry mix first, pour that into a large pitcher (or straight into the glasses), then rinse the blender out and make the mango. I like to pour half and half into each glass, garnish with a few extra raspberries, and serve with wedges of lime. 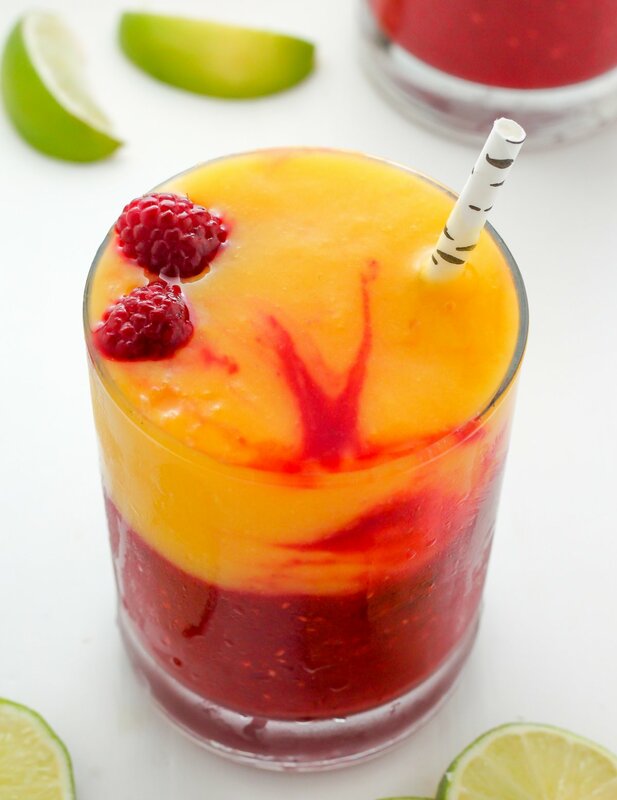 Incredibly refreshing, extremely pretty, and SO delicious – these Raspberry Mango Margaritas have it all. 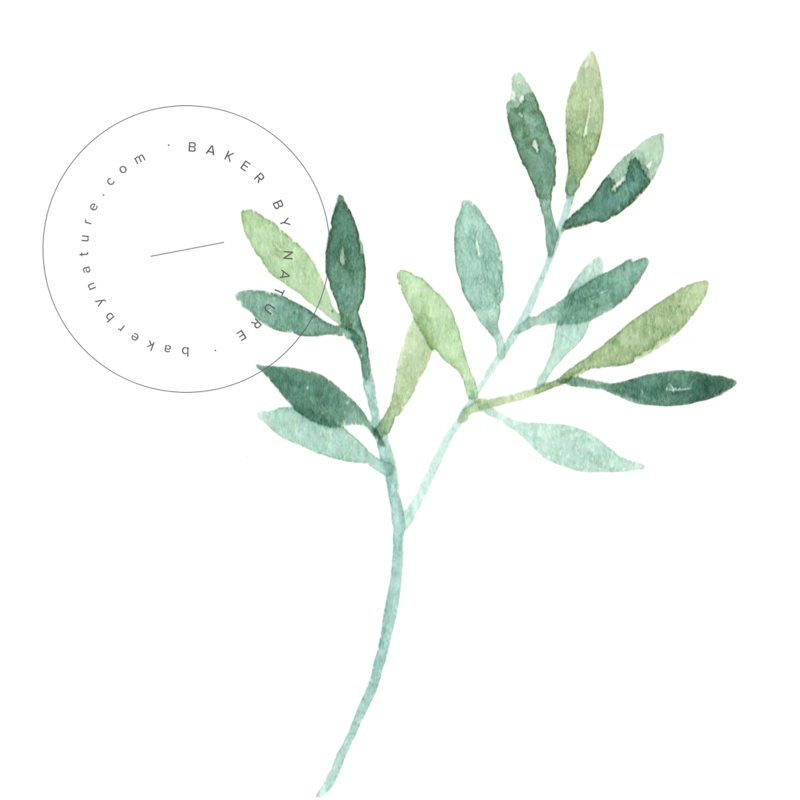 Combine ingredients in the body of a blender and pulse until smooth. 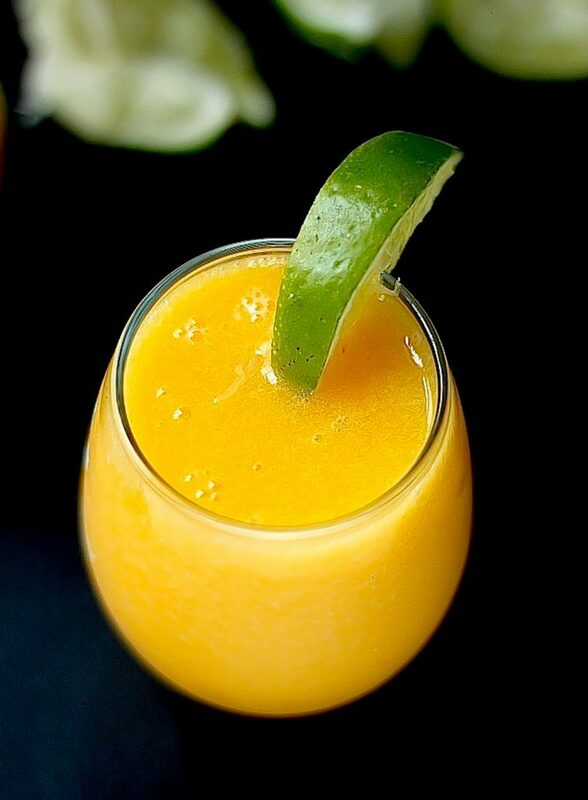 Pour into a large pitcher, wash out the blender and repeat for mango margaritas. 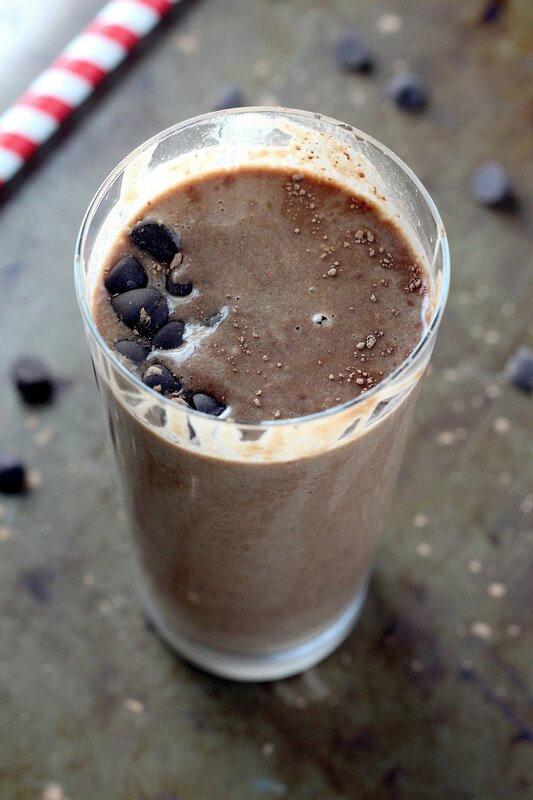 Combine ingredients in the body of a blender and pulse until smooth. 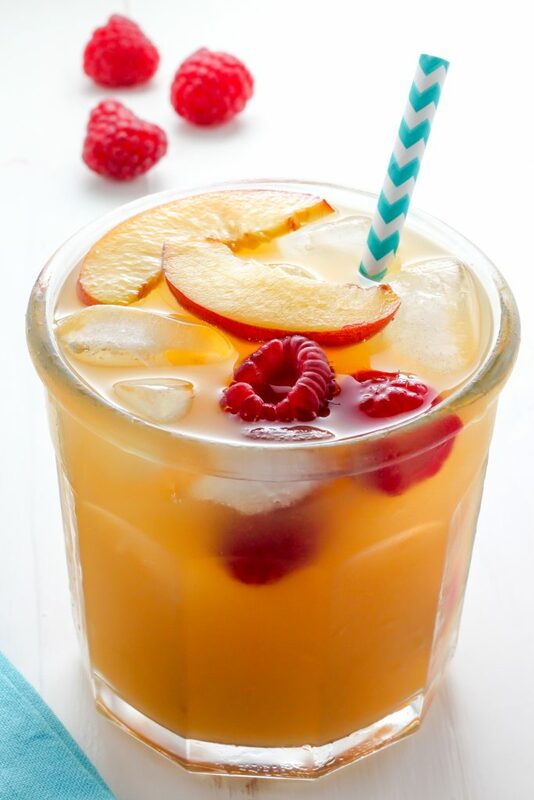 Fill each glass with half of the raspberry mix, then top with half of the mango mix. Serve at once! I love the color contrast! Certaintly a way to impress your party guests from the start! Can Not Wait! To make these when I have friends over this weekend! Thank you! You’re so welcome! Enjoy 🙂 And as always, let me know if you have any questions prior to making the recipe. GORGEOUS!!! I want to be poolside with this in hand stat! Can you use just regular sugar? Would it be a big deal to leave out the raspberry liqueur? Can I make these the night before? If so, would you recommend outing them in the fridge or freezer? Has anyone tested this recipe? What’s the texture like? Too thick because of the fruit pulp? If so, how’d you resolve that?? ?